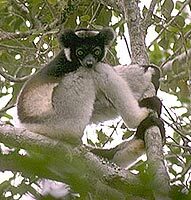 The indri is a large, distinctive lemur with a very short tail. Its pelage is very dense and the coloration a mixture of black and white. There is considerable variation in the mixture of black and white throughout the species' range. The indri has a head and body length of more than 60 cm (24") and a tail length of only about 5 cm (about 2"). It weighs 6 - 7.5 kg (13 - 17 lb). The indri's diet consists largely of leaves, flowers and fruit. It is primarily arboreal and diurnal. It moves through the canopy with spectacular bounds of up to 10 m (33') between vertical branches and trunks. Prior to dusk, a group settles in a sleep tree, 10 - 30 m (33 - 100') off the ground. Foraging can take place at all levels within the canopy. Occasionally, the animals descend to the forest floor to eat soil. Group size varies between 2 - 6, and normally comprises an adult pair with dependent offspring of varying ages. Within the pair, the female tends to be dominant and has priority at food resources. These family groups occupy ranges which are proclaimed by the indri’s characteristic eerie wailing songs (which are answered from as far as 3 km (2 mi) away). The songs may help maintain spacing between groups of indri, leading to a relatively small degree of overlap between the home ranges of neighboring groups. In the early 1900's, the indri was so common that one traveler reported that no one could travel from Tamatave to Antanarivo without often hearing its cries. By the 1960's its abundance was decreasing due to deforestation. 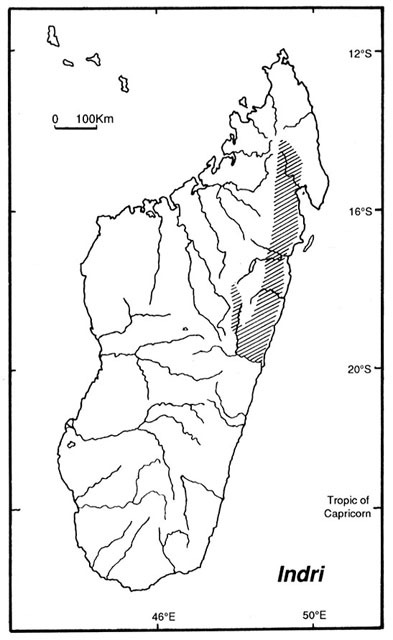 In the 1990's it was thought to occur in the central-eastern and northeastern rain forests of Madagascar from sea level to around 1500 m (4900'). Its range extends from the Mangoro River in the south to the area just southwest of Andapa in the north. The indri is severely threatened by deforestation of its habitat for fuel, logging and slash-and-burn agriculture. Even forests lying within the bounds of protected areas continue to be felled and disturbed. Indris are not hunted by the local people because of taboos ("fady"). However, there are reports of immigrants from other tribal groups and even some foreign immigrants hunting indri. *** The indri is the largest lemur. *** The Betsimisaraka tribal name for the indri, "babakoto," means "Ancestor of Man" (Garbutt 1999) . *** In many areas, local taboos ("fady") protect the indri against hunting. *** Before deforestation occurred, a separate troop of indris occupied almost every ridge in Madagascar's eastern forests (IUCN 1966) . In the early 1900's, the indri was so common that one traveler reported that no one could travel from Tamatave to Antanarivo without often hearing its cries (Curry-Lindahl 1972) . Up to the 1960's it was known from the forests of the eastern volcanic mountain chain of Madagascar, between the Bay of Antongil in the north and the River Masora in the south (IUCN 1966) . At that time its abundance was decreasing due to deforestation. 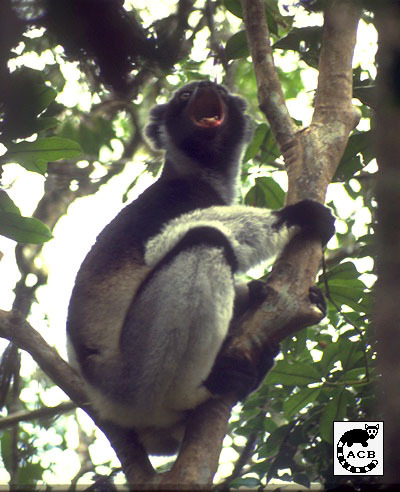 The indri is found in primary and secondary lowland and mid-altitude rain forest from sea level to about 1500 m (4900'), although elevations below 1000 m (3300') appear to be preferred (Garbutt 1999). Indris do not reach sexual maturity until 7 - 9 years of age (Garbutt 1999). 120 - 150 days (Garbutt 1999). Minimum viable population density: 3 individuals/sq km (7.8 individuals/sq mi) (Silva & Downing 1994) .